Well bred Poodles enjoy a good overall level of health. This is because Poodles come from tough original breeding stock and because responsible Poodle breeders have been making great efforts to keep the breed healthy in the modern era. As with other breeds, and indeed all livestock and even humans, the Poodle population carries in its gene pool a number of hereditary health conditions. Responsible breeders have been using their observation skills as well as current veterinary and genetic information to keep these conditions to a minimum. THE BEST WAY TO OBTAIN A HEALTHY POODLE IS TO GET ONE FROM A REGISTERED BREEDER WHO PARTICIPATES ACTIVELY IN THE STRATEGIES TO MAINTAIN A HEALTHY BREED. In March 2012 the Poodle Club of NSW worked with a major genetic testing company to run a webinar (online seminar) on canine genetics and the current understanding of hereditary diseases. The webinar enjoyed the participation of over 80 Poodle fanciers. On 21 May 2012 the Club invited Dr Karen Hedberg B V Sc to lead a presentation to a Club meeting on Poodle health issues. Dr Hedberg kindly provided a copy of her discussion paper on this subject and then spoke extensively, answering the many questions put to her by those present. “Any breed improvement scheme needs long term goals. This starts with full acceptance by the breed club/s of a need to test for an inherited disease, as well as agreement on the test to be used (or those that are acceptable) on a national basis. All animals must be individually identifiable by a microchip or a unique tattoo from a nationally based tattoo scheme. The implementation of testing is then followed by the application of LRLs* (and ideally pedigree endorsement**) by the ANKC after a national referendum to have the restriction applied. * NOTE: LRL = Litter Registration Limitation. This involves a requirement to test and establishing a “pass’’ benchmark. ** NOTE: the Club noted that it receives complaints from time to time about DNA profiling being inconsistent with pedigrees. Be strategic - Some recessive conditions can be tested for (eg Neonatal Encephalitis - NE) and where a line is known to carry it a test is useful to avoid inappropriate matings. Again, culling all carriers will not support the overall objective of maintaining as much diversity in the overall gene pool as possible. Establish priorities – Decide what are the main issues in your breed - which ones must be tested for, and which ones are best managed by reporting and recording cases as they occur. Gain confidence - It is important for breed clubs to establish a record/report system that has the confidence of responsible breeders. This may mean setting up third party (eg ANKC) operated data bases. Quality data which is based on a good reporting system allows breed Clubs to provide sound advice to breeders and the public. * NOTE: Dr Hedberg recommended that physical eye testing be done as well as DNA tests, as there is a range of important eye diseases that can be picked up in a physical test that a DNA test will not identify. ** NOTE: There is a low incidence of vWD in SPs and it is mainly Type I. The bad vWD is Type III. *** NOTE: Dr Hedberg noted that RD is a dominant gene with variable penetrance. Even if a puppy has the gene the extent of effect is not predictable at this stage of our knowledge. It is also necessary to be aware that being associated with the development of the kidneys, it hits – if at all - at different stages of development of the kidneys. 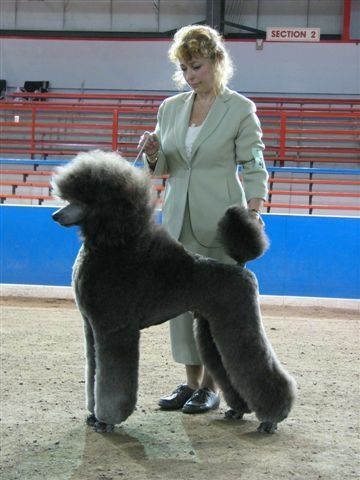 Until we have more information about RD Dr Hedberg recommended that breeders record and report all incidences of RD and that the Poodle Club monitor what is happening with data from the United States (given the larger number of Poodles there) so that a Breed Advisory can be developed when we know more. Priorities & Strategies – How can we best use information as set out in the above table? DATA –Club members can develop a way of recording breed health data using a 3rd party (ANKC?) that they are happy with and that supports responsible breeders. Record/Report - Dr Hedberg suggested that the Poodle Club could look at the reporting forms and systems being used by the French Bulldog Club of NSW and the NSW German Shepherd Dog League. Carrots vs sticks – Carrots work best. Eg The Poodle Club can support responsible breeders by setting up puppy listings and stud dog listings on the Club website with features that reward members who manage health issues responsibly. Tools for breeders – These may include publishing information about what to expect from various tests, record/report forms, info about reliable tests for carrier pups, and formats for what to say to puppy buyers. For recent information about the approach being taken by the Poodle Club of Canada, please click on the link. PC Canada has sought further information about the matter from the publishers of the original research and they are awaiting a reply.